BrainFacts.org is a public information initiative dedicated to disseminating knowledge about the brain. Powered by the global neuroscience community, it shares stories of scientific discovery and insight. 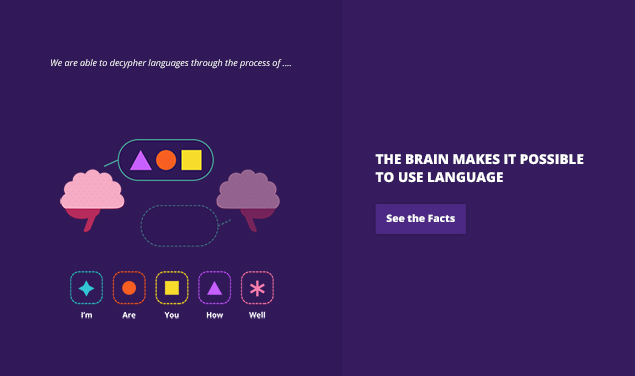 Blenderbox partnered with Brainfacts.org to create eight unique interactives, each one breaking down a core concept into an engaging, bite-sized lesson on how the brain works. 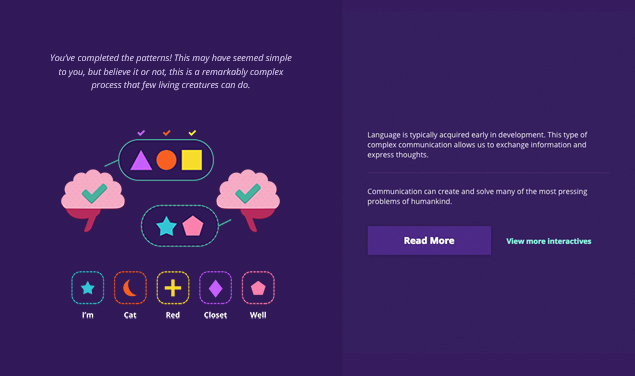 Brainfacts.org reached out to Blenderbox to create an interactive experience focused on teaching the eight core concepts of neuroscience. They needed to be engaging, accessible, and easy to understand. They also needed to be built in a modular format to be placed anywhere within the site. We created eight interactives, each distilling a key aspect of its respective concept into a fun, simple game. Using a scaffolding strategy to reveal complex information and theories as you engage with each interactive, and baking aspects of each core concept into the very interactions a user takes, the Core Concept Interactives became engaging teaching tools for students young and old. 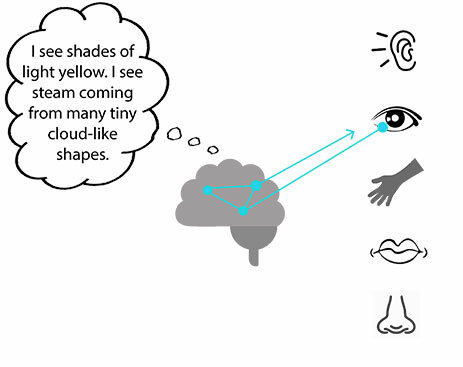 Brains are complex organs, and while the Core Concepts themselves are designed to get at the fundamentals of how the brain works, they can quickly become overwhleming if not properly paced. 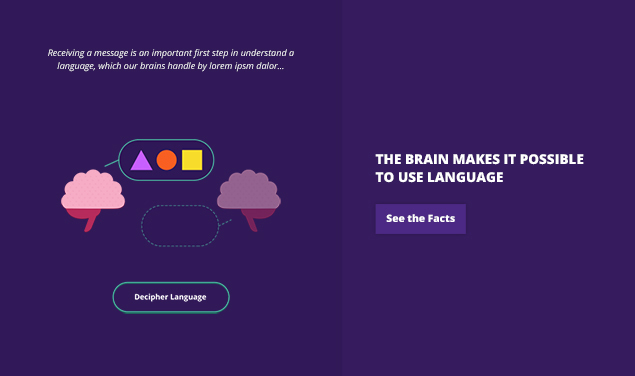 Throughout the project, Blenderbox worked closely with the Brainfacts team, including neuroscientists and teachers, to understand these core concepts so that we could effectively translate them into lessons accessible to many. It was an exciting experience, particularly as we learned about whole new developments in the field of neurobiology (there were even new discoveries being published while we researched the project!). It wasn't immediately clear how we should frame these interactives. Should they be games, with right and wrong answers? Or just objects you click to reveal information? How do we build it to work as a flexible plugin across the site, while still looking like a unified collection of interactives no matter where you encounter them? As we better understood the concepts themselves, we found the best solution was somewhere in the middle, combining a mix of gamified learning and storytelling, with informative text nestled within. 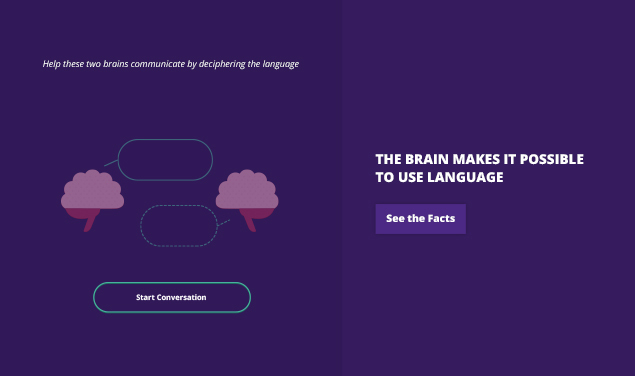 To bridge the branding challenge, we pulled from some of the gradient coloring of Brainfacts.org's banner pieces, expanding upon that color palette for a welcoming, tech-savvy style. 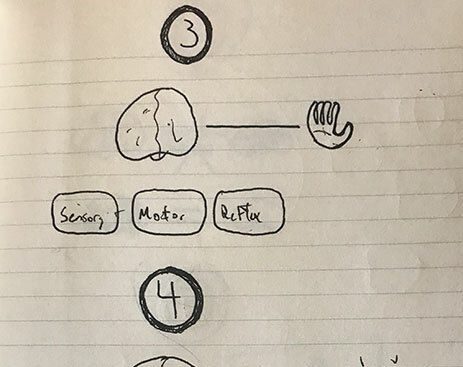 And while we wanted each game to be unique, with its own challenges and interactions to reflect the specific concept, we designed the framework in such a way that users could hop between them and quickly grasp the overarching mechanics. One of the biggest challenges was ensuring that each interactive remained focused on a single aspect of the lesson. Trying to cram too many lessons into a single interaction would lead to a muddled experience, with no clear learning outcome. We worked with the Brianfacts team to drill down to the most important aspect of each lesson, and built the interactions around that idea. Introducing simple mechanics that build upon each other to reveal more and more information, we allow learners to engage at their own pace and in their own way. For learners who just want to scan text, every interactive is accompanied by a punchlist of facts. Conversational interfaces, motion graphics, videos, narrative arcs, mini-games, and quizzes all structure the learning moments and lessons within the course. Developing an appropriate and consistent tone for the module was also important for creating a dynamic experience that kept the user engaged and interested. 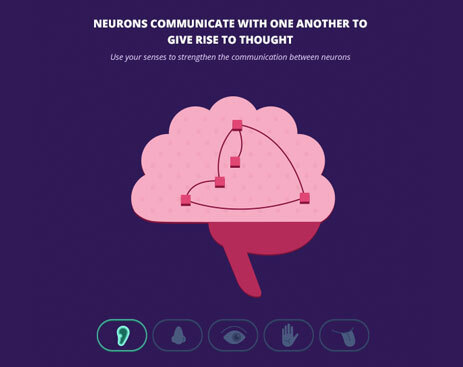 These interactives are live on brainfacts.org where users are encouraged to explore and engage first hand with the fundamental teachings of each core concept.